Image caption Man on the Beat shows the "rigorous training necessary to become a police constable"
More than 120 short films offering "snapshots of the UK's cultural, sporting, industrial and political heritage" have been put online. The documentaries from the British Council's archive date back to 1939, when the Council commissioned the films to showcase Britain to the world. Topics included health care, the legal system, Shakespeare and how the Times was produced each day. The films are now available to download via the British Council's website . Largely shown at embassies, consulates and to students and schoolchildren around the world, the collection has been preserved in the BFI National Archive for the past 30 years. 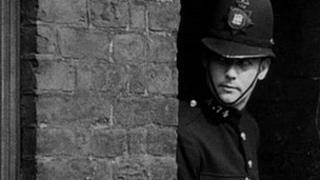 Highlights of the newly digitised documentaries include Man on the Beat, which "shows the rigorous training necessary to become a police constable". Life Cycle of the Onion uses time lapse photography to follow an onion from seed to leaf, to flower to harvest, and back to seed again. The Great Game follows teams to the 1945 Football League War Cup Finals at Wembley and Stamford Bridge, Chelsea's home ground. City Bound, meanwhile, presents a "patriotic look" at the daily commute into town faced by Londoners in 1941. The British Council said the collection represented a "significant chapter in British documentary film history". According to director of film Briony Hanson, it also gives "a unique insight into how Britain wanted to portray itself internationally - a portrait which was probably quite far from the truth". "With our self-image very much in the spotlight again this summer as the world watches the Olympics and the Jubilee, these films encourage us to ask timely questions about what it means to be British," she continued. Some of the shorts feature work by those who went on to carve out successful careers in the industry, among them director Ken Annakin and the cinematographer Jack Cardiff.